Youth, freedom, festivity, break ground, freshness, debauchery… are some of the sensations transmitted by the new perfumery packaging line that Pujolasos launched. 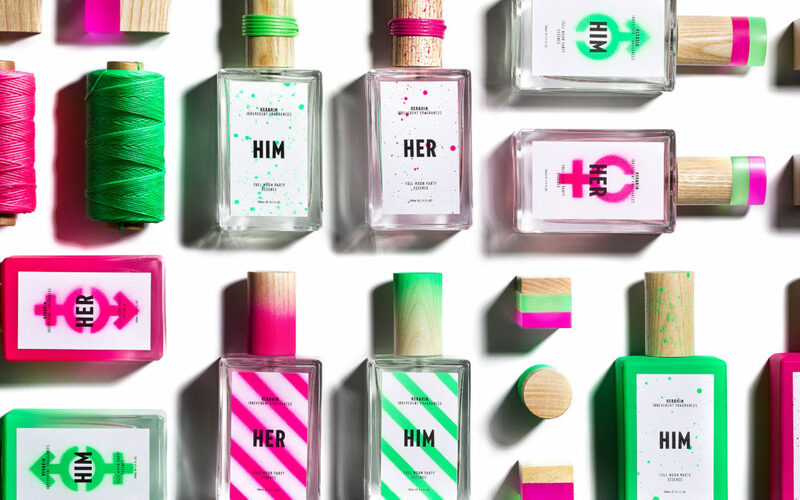 Her & Him, as the new collection Street Trends has named, breaks with the industry’s schemes for its audacity, its development and its and fluorescents tonalities. In technical terms, and for first time, a unique symbiosis has been created: wood, resin and the use of color techniques following the Street Trends tendency that highlight graffiti. These elements could be perceived both in the crystal bottle, and in the wooden cap, developed entirely in the Pujolasos facilities in Sant Pere de Torelló. Fluorescent pink is the protagonist of Her, aimed to female public. For the male public, whose collection called as Him, has been chosen green fluorescent. For the two ranges three different designs have been developed, that also bet for the combination of different materials in the cap, and the graffiti effect in all elements. With the design of the packaging has would transmit the youthful spirit characteristic of the range. According to the firm predictions, the new Her & Him collection has been designed as tendency proposal for summer 2019. The project has been led for the new Innovation & New Developments Manager, Mrs. Gal·la Romera that contribute with her innovation knowledge in packaging. Her & Him, is designed for a youth, casual, disruptive, bold attitude with a highest acquisitive level public. Pujolasos has made a strong commitment for the innovation since its foundation in 1967. For this reason, recently has been inaugurated the new R+D+I department that has allowed the latest month launch to the market pioneering and exclusive products, careful and always worked with the latest technology. With this launch, the specialized firm in wooden premium packaging started the development of different standard ranges that will have as protagonist of the combination of material, the unique techniques to develop and the personalization of products.